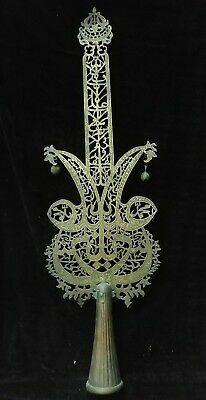 Seller: precious.antiques (39) 100%, Location: MUMBAI, MAHARASHTRA, Ships to: US, Europe, CA, AU, Item: 264202430706 Precious Antiques Islamic Alam Pierced Art work., This has tappered shaft for holding on long sticks, used for occasions. The work on this is extraordinary . Please see the photos. Measurement - 30.5 x 9.5 approx Weight - 1.9 kg approx We Ship Through India Post which Usually takes 10-15 days . Payments are accepted through PAYPAL InternationalCustoms/Duties Import duties, taxes, and charges are not included in the item price or shipping cost. These charges are the buyer's responsibility. Please check with your country's customs office to determine what these additional costs will be prior to bidding or buying. Condition: All network on solid brass and handmade .See the photo to enjoy the most extraordinary work .